When green tea meets water from the Azores’ hot springs, an unexpectedly colorful brew is born. The island of São Miguel in the Portuguese Azores is lushly green, with rolling tea plantations in orderly emerald lines, orange flowers yawning open beside rock walls, and blush-purple hydrangeas blooming alongside craggy volcanic pools. In the town of Furnas, a civil parish of 1,400 people on the eastern side of the island, simmering springs thicken the air with steam. When this spring water combines with one of the island’s signature teas, the brew, originally gold-green, turns an inky indigo. The Azores are an autonomous chain of Portuguese islands located in the mid-Atlantic between the Portuguese mainland and Morocco. As such, São Miguel’s subtropical climate makes it home to some of Europe’s only tea plantations, Chá Gorreana and Tea Porto Formoso. While green and black teas are plentiful across the island, São Miguel also offers its own unique variety: purple volcanic tea. At Chalet de tia Mercês, a tea shop in Furnas, brewers use a tap specially connected to a volcanic spring to pour naturally hot water for this violet tea. 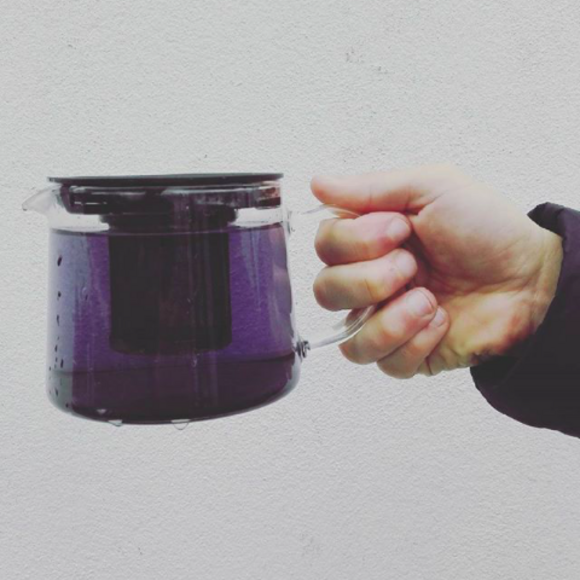 The brew’s color is due to a chemical reaction between the antioxidants in the tea and unoxidized iron in the spring water, which makes the resulting mixture refract light to a luminous purple. The flavor is earthy, with clay-like notes. Violet volcanic tea isn’t the only culinary wonder to come from São Miguel’s hot springs. Visitors to Furnas can also taste cozido das Furnas, a Portuguese chicken, pork, and vegetable stew cooked in the natural volcanic heat. After enjoying their tea and stew, visitors can themselves steep in one of the island’s many swimmable springs. The Azores’ unique tea plantations reveal part of the history of Europe’s love for the beverage. While the drink was already popular in Europe, Azoreans first imported tea for cultivation from India and Japan in the 1860s, following a blight that wiped out São Miguel’s orange crop. Unsure how to grow tea, Azorean farmers enlisted the help of Lau-a-Teng, a Chinese tea expert, and a number of other Chinese tea farmers, to help develop the industry. The Portuguese word for tea, chá, itself contains hints of this complex history: The Portuguese initially traded for tea via Macau, where locals used the Chinese word cha (茶) to describe the precious brew. The proprietor of this tea shop uses hot spring water to turn green tea purple. Portugal's volcanic archipelago is home to addictively sweet and chewy muffins. In this island town, stew gets cooked by volcano. These Japanese sweets demonstrate the ephemeral beauty of the seasons. With a squeeze of lemon, this plant can turn any drink into a color-changing mood ring.